I often times receive requests for classic, vintage and old fashioned recipes. I have found that families are pretty much the same all over the world, the Grandma, a favorite Aunt, a Mom or Mother In Law made a favorite family recipe and never wrote it down, we have sure had that situation in our family. One of the most requested recipes that I am asked for is "that old fashioned fruit salad recipe that someone in that family made, and would you happen to have one that might be that recipe. I mentor a group of young homemakers and recently this is one of the recipes that they were asking for. Part of the purpose of Miz Helen's Kitchen is to preserve the integrity of our recipes that have been handed down though all of our families, as we help our younger generations become the kind of cooks they aspire to be. In a mixing pitcher, whisk together the mayonnaise or Miracle Whip, lemon juice, salt, pepper and sugar. Mix well, refrigerate until needed. 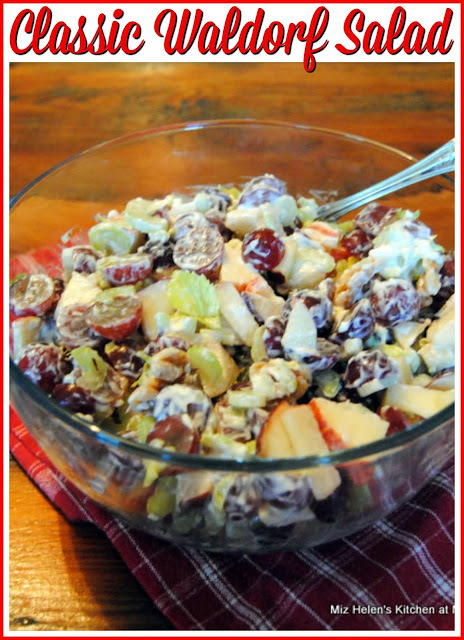 In a large mixing bowl toss together the apples, grapes and celery. Drizzle 1 teaspoon lemon juice over the fruit and toss. In a heavy skillet, toast the walnuts until just starting to brown. Pour the chilled sauce over the fruit and toss together. Add the walnuts just before serving. 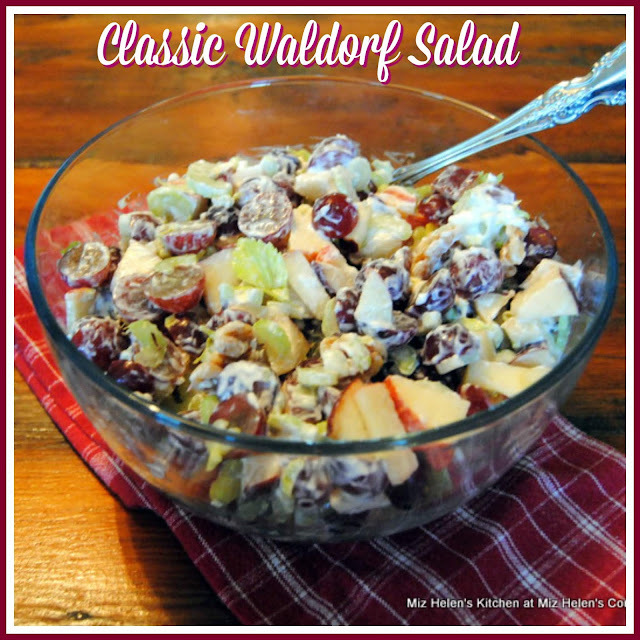 I sure hope you enjoy this Classic Waldorf Salad, and will be able to use it for your special dinners and luncheons. For my Future Homemakers Group, this one is for your notebook, enjoy! If you have a classic, vintage or old fashioned recipe you would like to see us try, then just let me know and we will make it for you! Hope all of you have a fantastic week and come back to us real soon. This is a classic and I haven't had it for decades, I need to make some asap! Mmmm! Now I'm hungry for a nice big bowlful, I could easily make a meal of it!